Flooded homes in a New Orleans neighborhood after Hurricane Katrina destroyed much of the city in 2005. The wrath of Hurricane Katrina hit New Orleans on August 29, 2005, resulting in an unprecedented cataclysmic natural disaster for the United States. But how “natural” was it? There are many nominations for the true sinister forces behind Katrina. 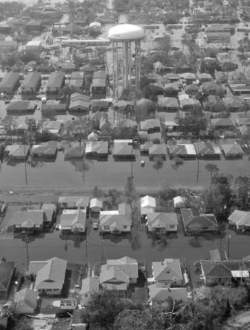 It wasn’t as if scientists and environmentalists hadn’t been warning city, state, and federal governments for years about the disaster of biblical proportions that was waiting to happen in New Orleans. Government gadflies had named New Orleans as one of the most vulnerable areas in the Bush administration’s continued neglect of the nation’s deteriorating roads, bridges, tunnels, and levees. Even the much-beleaguered Federal Emergency Management Agency (FEMA) had listed a hurricane strike on New Orleans as one of the most dire threats to the United States. An article entitled “New Orleans Is Sinking” by Jim Wilson in the September 11, 2001, issue of Popular Mechanics warned that the surge of a category 5 storm could put the city under eighteen feet of water. The fact that the city had not already sunk, Wilson suggested, was strictly a matter of luck. “If slightly different paths had been followed by Hurricanes Camille, which struck in August 1969, Andrew in August 1992 or George in September 1998, today we might need scuba gear to tour the French Quarter,” Wilson commented wryly—and prophetically. Weather weapons developed by black-ops agencies in cooperation with New World Order scientists sent the hurricane to New Orleans, a major U.S. port, in order to begin the move to martial law throughout the nation. Future targets will include New York and San Francisco. George W. Bush, the CIA, and the Miami Cuban mafia conspired to create a manmade disaster with the goal of eliminating a sizable number of New Orleans’s black population in order to strengthen the GOP’s voter base. God created Katrina to punish the gay population of the city. Several Christian fundamentalists have described the hurricane’s destructiveness as retribution for flouting the Creator’s distaste for gays and for such irreligious decadence as the Mardi Gras celebrations. The Yakuza, the Japanese “mafia,” used a Russian-made electromagnetic generator to launch the first of a series of devastating storms against cities on the U.S. mainland. Navy Seals, the Army Corps of Engineers, or a black-ops agency deliberately blew up the New Orleans levees to flood the poorest black neighborhoods. Louis Farrakhan, the Nation of Islam leader, exploited black paranoia and popularized this conspiracy claim. The Ku Klux Klan took advantage of the storm to blow up the levees in order to flood the city’s black neighborhoods. A cabal of New Orleans real estate agents hired demolitions experts to plant explosives in the levees in order to flood the city’s poorest neighborhoods and drive up property values in upscale sections of New Orleans. Zionist agents blew the levees as revenge for the U.S. endorsement of the Gaza evacuations of Jewish settlers. A test by the Pentagon’s secret weapons program of meteorological manipulation backfired when the electromagnetically controlled storm moved from Cuba, where it had been directed, and traveled to Florida and Louisiana.